NOTE: If you are an individual, a business, or an organization other than a school and wish to purchase this document, you MUST contact our office PRIOR to processing your payment for approval. We can be reached via email at office@vcpe.org or by phone (804) 423-6435. Accredited private schools may access the 2018-2019 Virginia Law & Private Schools Guide HERE. Virginia Law and Private Schools is published annually by the Virginia Council for Private Education (VCPE), to support the motivation and commitment to quality education needed to operate a private school of high caliber. VCPE encourages all private schools to explore the possibility of state recognized accreditation through an approved accrediting association. Regulatory and statutory changes made throughout the year are incorporated into the guide annually and newly discovered or updated resources are shared. All administrators and business officers are encouraged to review the entire guide annually and to consult with professional legal counsel with specific questions to ensure compliance with all state and legal requirements. 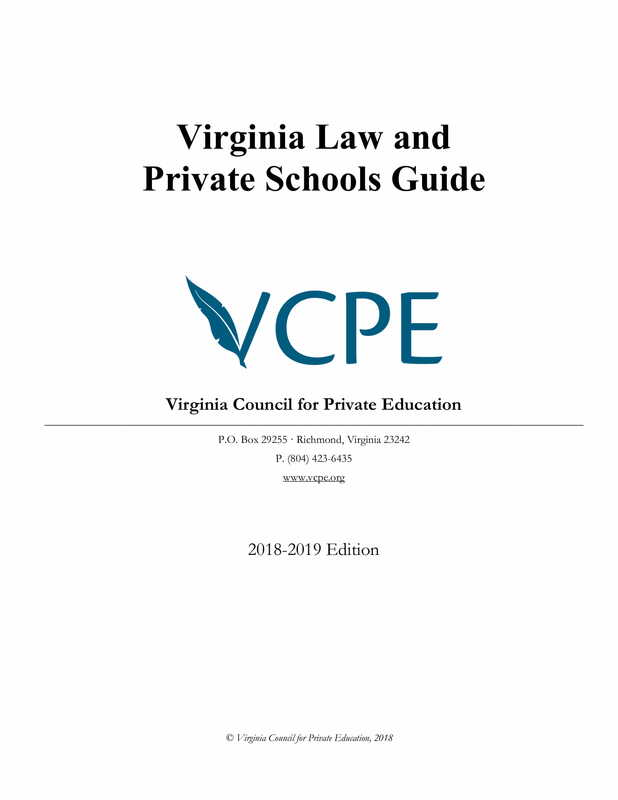 The Virginia Law and Private Schools Guide is a benefit of VCPE membership and is provided to all accredited private schools. Non-accredited private schools may wish to purchase our law guide. Please see below. Are you an individual considering opening a private school? Are you a private school without accreditation, wishing to purchase our law guide? You can purchase the NEW 2018-2019 law guide by clicking the picture above.